There are some things you should be asking yourself if you are considering bringing new decor and accents into your home. These questions will help you buy, edit, curate and organize your home. And keep you from feeling overwhelmed! Let’s be savvy decorators! This is the first question we should all ask ourselves before we dig down into our purses and pull out our wallets! Do you love it? Really, really love it? If the answer is a resounding YES, great! Go right on to question #2. If you like it and it is on super sale and can save tons of money put it back! ONLY BUY WHAT YOU TRULY LOVE! If you don’t have room for it, don’t buy it! 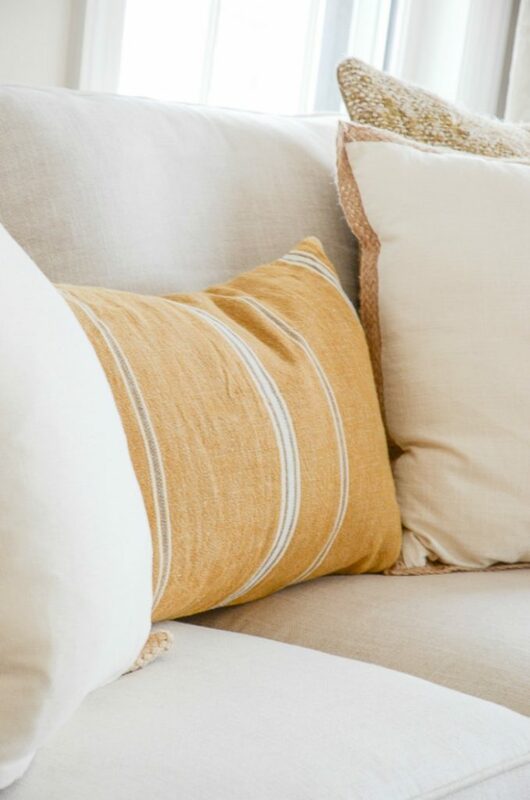 No home furnishing is worth the mental frustration of bringing it (whatever that is) into your home and then having it not work in your house or trying to find a place for it! UGH! No piece of furniture is worth that! It’s easy to buy a bunch of little home decor pieces and end up with a bunch of pretty “stuff” that does not work together! This often happens because we don’t know our decorating styles! Knowing your own unique style will help you immensely! It will help you know what will and won’t work in your home. And it will save so many headaches and lots of money! And not knowing about your unique style will help you choose and curate beautiful items for your home. I can’t stress this enough!!!!! 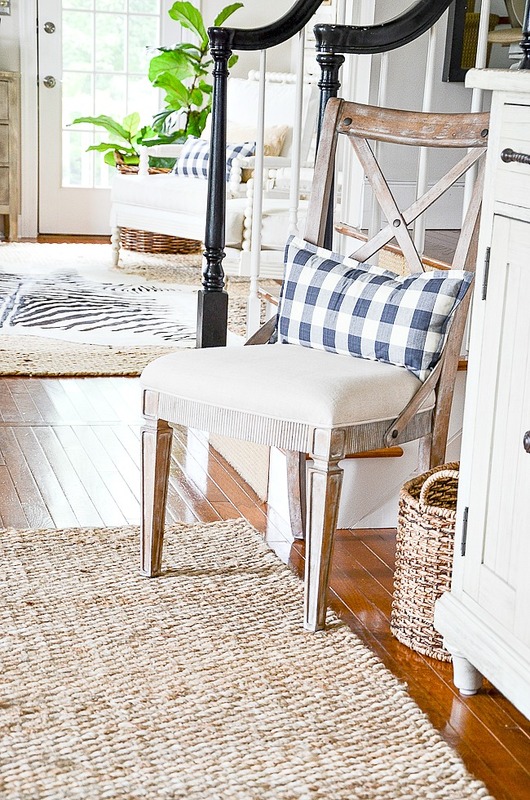 Go HERE to see how to find out your decorating style! You will be so glad you did! Is there something you have that can be upcycled, refreshed, repainted or repurposed that would work just as well and save tons of money? 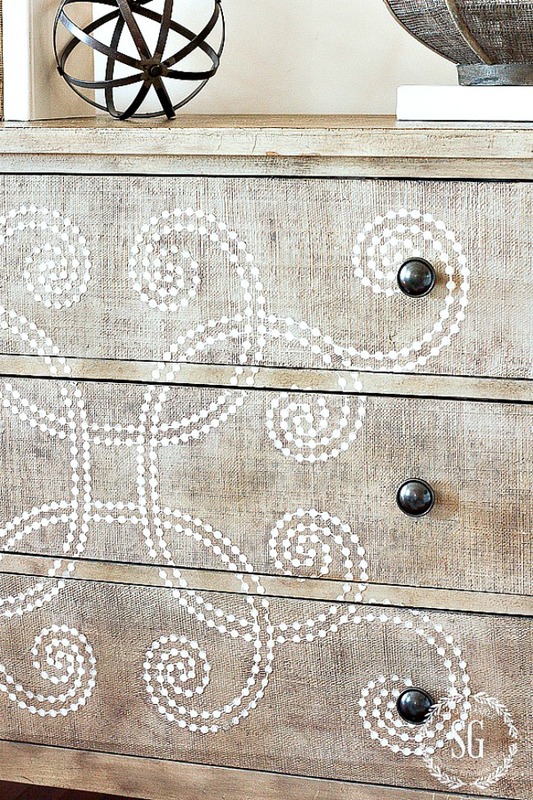 Blogs are fabulous sources for making old things better than new! Before you buy… think, think, think! Take a mental inventory of what you have and how you could reuse it! As I’m writing this I am doing a mini refresh of my living room. I have two amazing lamps that I want to keep. The shape and style work perfectly for this room but the color is wrong and the lampshade needs replacing! So I’m getting out my magic paintbrush and painting them. I’m also adding new lampshades to them too. Voila, better than new! This is the BIG question! So why is it not number 1? Although being able to afford the home-decor-thingy-you-have-found-that-you-love-on-sale-and-must-have-it-now is of the utmost importance, the first 4 questions tend to weed out a whole lot of unnecessary buying! NOW it’s time to answer, “Is this something I can afford”? This is a question between you and your wallet, and maybe God, and okay, maybe your husband or others living in your home! Don’t buy ANYTHING that will make you house poor! That fancy new _______ (fill in the blank) is not worth your peace of mind! I don’t care how beautiful it is! 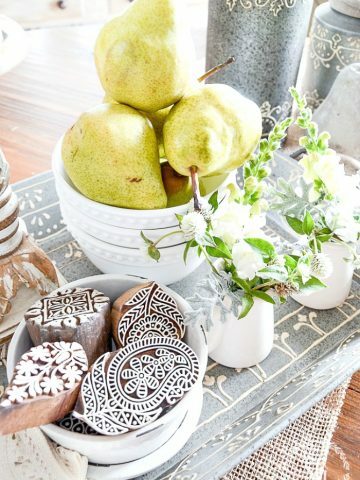 Even small home decor pretties can add up to be a whole lot of money trouble! If something is too expensive, it’s a good thing to save for it! We never buy it unless we can pay cash! This saves us from lots of headaches and sleepless nights! I think having to save for something makes it even more special! THINGS WEAR OUT, GET TIRED, BECOME DATED AND JUST DON’T WORK. All home furnishings have a lifecycle. Things change! Everything changes. And so should your decor! I have many clients and family member I help. It’s so sad when they have let their homes get so terribly outdated they really don’t like them. Just like everything else, create a budget for your home decor. THIS IS NOT FRIVOLOUS! It’s your home. It’s where you live! Create a home that is comfortable and beautiful and in your budget. As things change and get dated or get worn and beyond their expiration dates plan to replace them little by little. It’s so much easier than waiting until a whole room needs a makeover. Believe me, I’ve done that and it is a lot of work! Read #5 a few times and really think about it! Don’t make this a habit! Go for it and don’t look back! But know the return policy! This happened with the armoire in our master bedroom. 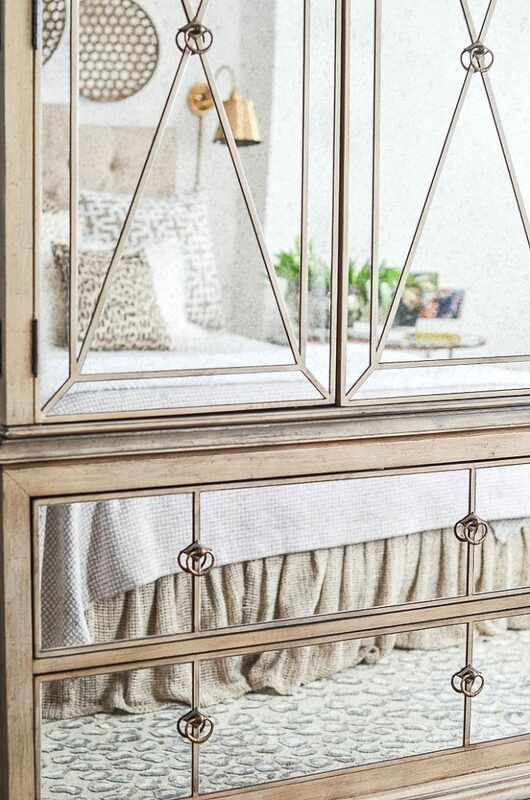 I saw it and instantly fell in love with it and I knew it would be PERFECT for my master bedroom. But the price tag caused me a lot of pain! So I opted for a more in-my-budget pretty armoire. When it came to live in my bedroom it was not right. Pretty, but not the look I wanted for my bedroom. So returned the second-choice armoire and got the one I first loved. And it was sooooo worth it! Could I afford it? Yes, we had been saving quite a while for the room makeover. So I spent the extra $$ and have a piece of furniture that looks perfect in my bedroom (after all it was the perfect piece) and it will stand the test of decor time. The morale of this armoire tale is ONCE IN A BLUE MOON! Being assured of the answer to the question above will give you peace of mind and make decor purchase a whole lot easier! I don’t sweat purchasing items, especially online, when I can get my money back! I’ll think twice if I can get a store credit for returned merchandise. And I’ll really have to be sure the thing I am buying is exactly what I NEED… and not just want to make a purchase I can’t return! Remember if an item can’t be returned you are stuck with it no matter what. Make sure and make sure again it is absolutely perfect before making even a small purchase you cannot return! BTW: I always ask the return policy at a store I’ve not shopped in before! Everything has a life cycle. Styles change. Things get worn out and tired looking. Haven’t we heard that before in this post? The more I spend for something the longer I am going to have to live with it! I once bought two 18th century sofas. They were absolutely stunning!!! I saved up 5 years to buy them and they cost a bundle! I lived with those 2 sofas for 27 years! 15 years longer than I would have like to. But, because they cost so much they had a long, long, l-o-n-g life cycle. Think about how long you want something to last in your home and don’t pay a penny more than the years you are willing to live with it! This is a personal equasion for all of us to consider. Be savvy! 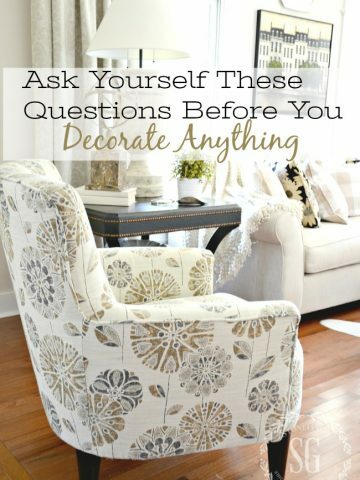 Why spend $$$$ on decor and you only want it to last $$ long? Be smart! You don’t have to buy the most expensive things that will last generations! You kids probably won’t want you old (but beautiful) stuff! Spend just enough money to get good quality that will last until you get tired of it! If something takes extra work I’ll probably pass it up! I don’t like extra upkeep! If I can’t sit on it without worrying I have a cup of coffee in my hand or I have to be extra careful not I drop and break something for fear of having a nervous breakdown it probably won’t be in my home! Make sure you have made peace with the items you buy for your home! If the special care you have to give things is giving you a headache they’re probably not bringing you joy! Don’t buy anything you are not willing to take care of. It’s not worth it no matter how fabulous it is! Believe me on this one! I’m not an impulse buyer! But I sure could be! 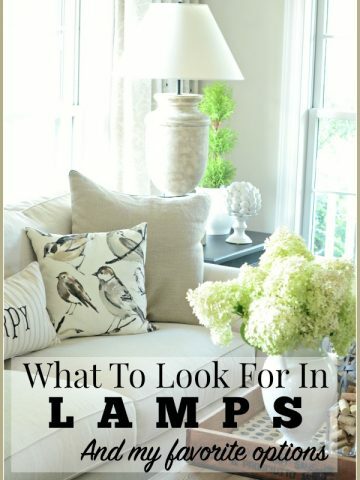 I have learned over the years to check out all the great places to buy home decor before buying anything! With the internet at our fingertips and on our phones, we have a vast inventory of stores and sites to buy home decor. And we can often buy really nice decor at discount prices. When I am shopping for a large ticket item this is part of the hunt! I’ve saved lots of money by doing a little research on the internet to find the best deals! I think it makes the prize all the sweeter! Remember the armoire we talked about earlier. It was an expensive piece for our budget but the brand was one I LOVE and I knew the quality and I found it 33% off the retail price. I found a site that offered it at a discounted price. Score! You can see all the sources for the master bedroom, including the armoire, HERE. No matter how large or how small our home decor purchases are we should always make them count towards the beauty, appeal, and comfort of our home. 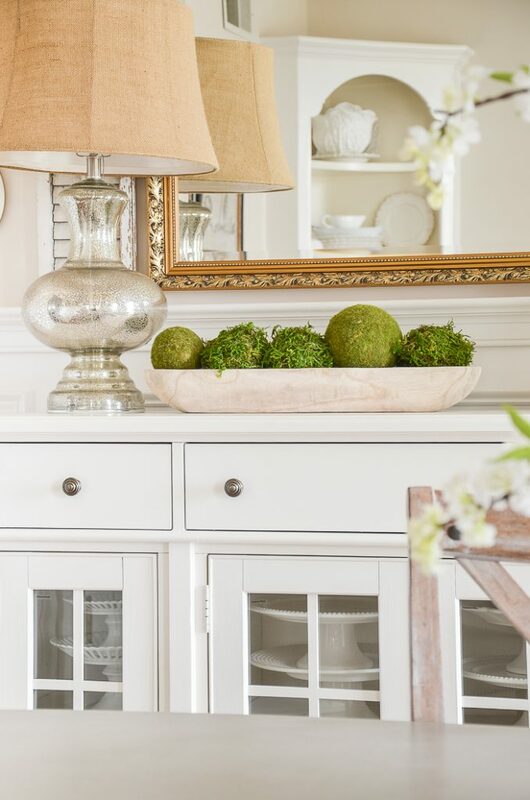 If we are wise with everything we bring into our home, our home will reflect that exacting, thoughtful care! And, it’s so important to think of decorating as a process not just a once and done thing. Our homes, like us, should evolve! Have you been spying on me? Maybe were twins but don’t know it. Lol. You pegged me with all ten if these. Especially with the antlers. Im determined to find the right place for them. That’s embarrassing. I happen to be purging right now. This is great advice. I’ll think of these tips while I’m shopping. P.S. Just bought a big wooden bird cage this morning? Thank you, Yvonne, for the great advice! My son says wait a week and if you go back and it’s still there, it’s meant to be! Not so! Does it is something you love, need, can afford, and works with your decor style? Those are the smart questions to ask yourself too! Your style is beautiful and refreshing. Light and airy! I work in a retail home decor store and we are asked so many questions. 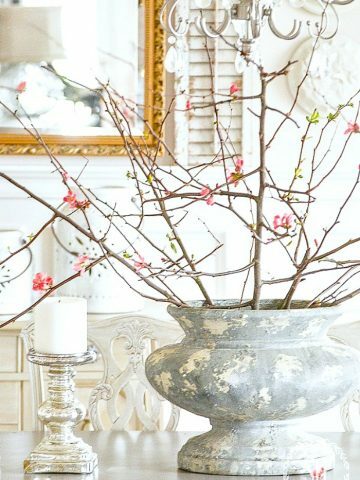 My go to advice is to keep your large pieces neutral…the ones you will be decorating around for a number of years. I’ve started recommending your blog to our customers. Best advice and so much wisdom! Great advice! You are spot on! And, to chime in with a lot of the comments… I love your style – absolutely lovely! 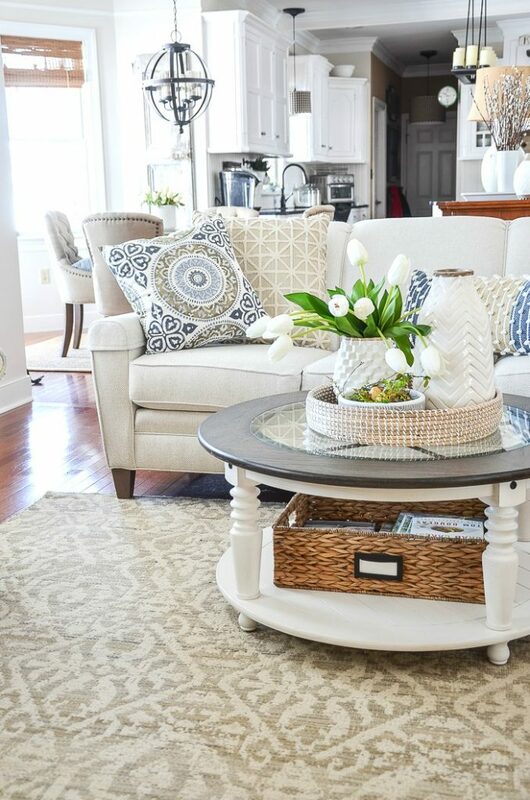 Your style is refreshing and inviting! I ask myself the same questions when shopping for my home. I am trying to incorporate some of your light color and style into my home. I have a constant dilemma decorating my living room! It is a long narrow space (11 X 21)! Placement of furniture is a challenge. The entrance to our home is at one end of the space and the other end leads to the dining room to the side of the space. Any suggestions of how to deal with a room like that? I am happy to know that even professionals have to go through this process. It always looks like it comes naturally. I was smiling when I read this post ~ I do the exact same thing trying not to accumulate too much stuff. Thanks for the post! The best part of your article for me is when you talked the importance of only buying home decors that you truly love. My daughter is looking to decorate her house to give it a newer look. It’s important for her to make sure that the designs and decors of her house are all according to her wants and needs. This is to make sure that her personality is going to be visible in every part of her house and to make sure that she’ll end up satisfied with her choices. It will make sense for her to choose items for her house that she truly loves. I will make sure to share your blog with my daughter so she can consider all your tips. Never a plan and never a purge!!!! What a burden. I need to change my ways! Great advice. Even though I tend to shop at yard sales where things are quite inexpensive, I still bring home things I don’t need and have too much “stuff”. It’s always a tough call because I love taking stuff that is broken and unloved and then transforming it. I often find things in my own belongings that can be repurposed, too….even forgot I had! Though I have actually kicked myself many times for walking away from things at estate sales that I dwell on for months or years….and they are long gone. So, it really is tough to call. If I can get an awesome roll of upholstery fabric for less than $5 at an estate sale, I think I won’t try to talk myself out of it so often. Wow, what an article. I have tried from furnituring to clothing asking myself do I need this, or what would I do whit that. I find a use for it, but before I know it, I am tired of it. I find myself sometimes wasting $ that we don’t have to waste. I am trying to now just truly buy only what we need. I only buy a want every now and than. Thank you for this helpful article. As always, your design is stunning. Live and learn as they say. All such good questions to ask yourself prior to a purchase. Happy healing Yvonne; it will be great to advance to that boot! Wish I could start all over again! With your excellent list of hints I know I could do so much better in my choices when buying and choosing! But I am 78 years old and maybe it is too late to start over. I just love your home and how you have furnished it, just my style! Thank you for your insight. God Bless you! Only 9 more days!! These are such wise and thoughtful points. With all the emails coming from internet sources showing the latest and greatest, it is hard to resist and not buy, buy, buy! This list is helpful to keep the purchases to only loved decor . My husband likes to keeps things until they are falling apart — and that makes me crazy!! Lol! Blogs make me want to go out and change my home, too! So now I try to read them to help discern what style of things I really want to live with. Thanks so much for the good tips. I think I’m pretty good at practicing them but they were still a good reminder. I especially like tip #2. It’s really hard for me to use my head and not purchase something that I truly love if I don’t have room for it in my small (1,100 square foot) home. You got my attention this morning with “don’t buy any furniture if you don’t have room for it.” Passing up a bargain is very hard for me. Recently, I bid on two beautiful chairs at a silent auction and had the money to buy them, but two things prompted me to erase my bid – I didn’t need them and I could tell that another bidder really wanted them. Saved some money, storage and maybe made someone else’s day. Great advice as usual! It sure is difficult when you have of so many beautiful things! I have that same problem! Thanks for the post! Very good tips. I always ask myself the question- what will I do with it? Usually, I change my mind and put it back on the shelf. I often wish I had someone to go shopping with me and help me pick things out for my house! I just found this old post of yours on Pinterest. LOL – I should have read this as a reminder before I bought those wonderful love seats – I love their look and quality and price, but not happy with their color. *sigh* Oh well. Hugs. Great advice as always Yvonne. Sometimes I think people buy to fill a void in their life. They sometimes think that buying something new will make them feel better. Take it from a pro, things never ever fill that void in your life. I love reading your blog and I always learn something new or something that I can apply to my own life. Looking forward to another year reading your blog. You help fill that void and I thank you. Wishing you only the very best for 2016. Oh boy! Did your second sentence ever hit home!! A number of years ago, I was very unhappy and did the exact thing – buying items I didn’t need, no matter the price! A few were very pricy – I still have them as I feel I can’t just give them to a reuse (due to the initial dollar outlay) but am fed up looking at them. I am now in a condo and can’t even pack them away as I need every storage “inch” there is!! Hopefully, someday, I’ll meet someone who’d like these pieces and then they can move on! Sage advice! I also ask myself if the item has multiple uses: if I’m planning to use it in a fall arrangement, could it also work for spring or winter? I hate to spend money on a one-trick pony! BTW, I plan to pin this on my “Words of Wisdom” board…and reread it before a medium-to-large purchase! Thank you for the excellent advise—-just what I needed AGAIN! i love the picture of houses on the wall in your living room, i live in the uk who is the artist? i would love this in my dining room. What a BRILLIANT article! Thank you SO much for sharing your thoughts and obvious experience with us. I plan on printing out your list and putting it in my purse. It’s all too easy to buy something just because you like it rather than LOVE it, and I’ve now got to the point where I don’t have room to store things, so will be taking your advice really seriously. Oh wow…how appropriate for all of us who have been “housekeeping” for a while. We downsized …but I am having to work through a storage unit where tubs of stuff went, to be dealt with later. Well, later is now. Ha! Some things we will keep for the children as they want them. Some things…will just need to find new homes. Seems everyone is wanting to clean out the clutter these days. My mother was never one to keep extra stuff….but I did not learn. Ha! Clearing out extra stuff is a process. Sometimes I guess we have to hang on to “it” until we realize it just needs to GO. It’s a psychological process of sorts. I am hanging onto my older furniture pieces and getting ready to recover them because they are made better than lots of newer. Otherwise I would sell them. I keep things forever until I finally give in to the realization that they are just plain old and have no redeeming value. Ha! Then…toss. The circle of life. Love seeing all of your pretty pics and reading your ideas! Hi Yvonne! I just LOVE LOVE LOVE your blog – it’s one of my favorite ways to start my morning with a nice hot cup of coffee! Ok, while that sounded so peaceful — typically the coffee is microwaved 4 times and I have a toddler on my lap poking me in the eyes while I desperately try to soak up all the happy that your home, photos, spirit, and words provide!) Anyways, this is such GREAT advice and I always need to remind myself of these “rules” whenever our home MAKES me decorate and redecorate, etc. 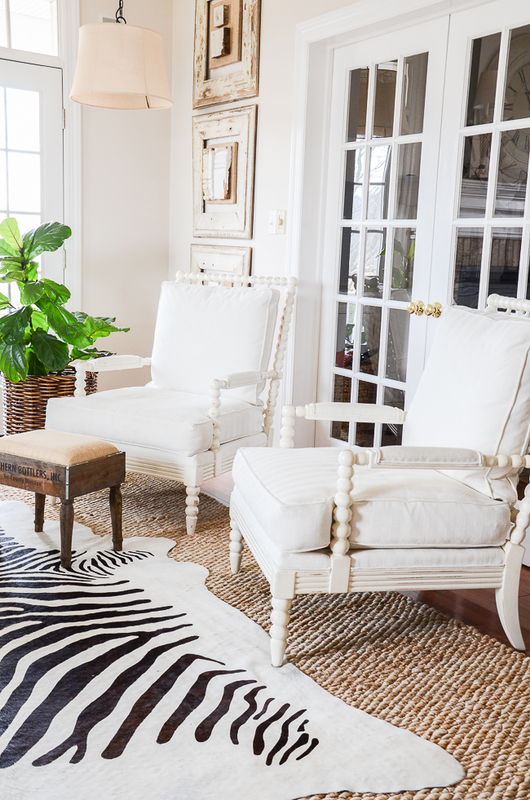 Quick question – I LOVE the rug in your living room – the zebra one. Where could I find that? Its classy while still using a fun print! Thanks again and Happy Mothers Day!! I found this on overstock.com. I also see it on Joss and Main now and then. I’m so happy to hear from you Ashley!!! So glad I can give you a few minutes of “blog” therapy amidst your busy day! Hugs! Discovered your Blog just a few weeks ago. Every morning with my first cup of coffee your Blog is the first item I read in my Inbox. I love all the advice you give and every DIY project. You take it from a “dream” to “reality”. Several years ago after my Mother passed away, it took me (an only child) 3 years to clean out her home of 65 years, move all the “treasures” I couldn’t part with, and get her home ready to sell. It was a gut-wrenching experience. Fortunately, I had a very close friend (my husband was not yet retired) who helped me each time I had to travel 7 hours to do more work. Needless to say, 10 years later, I still have “stuff” I need to purge. I have finally accepted that those objects produce treasured memories which stay forever, but the “stuff” can now be given away to those who can use it–whether family, friend, or stranger. Thanks for this subject to re-energize my efforts. 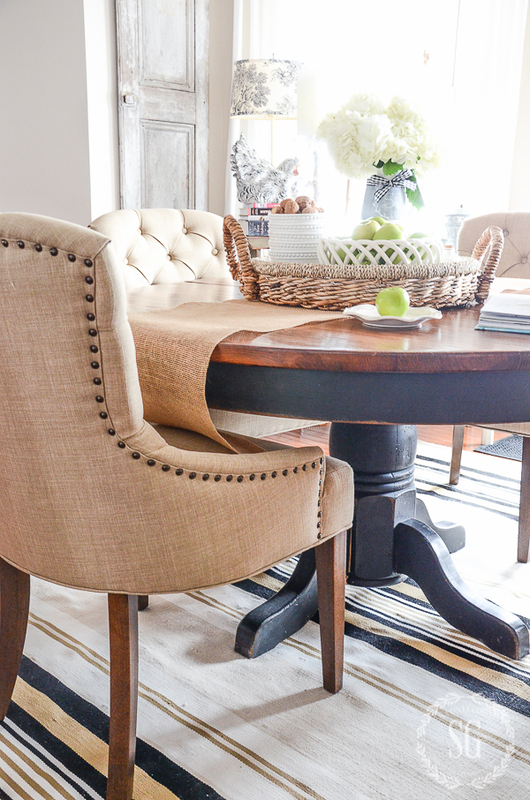 On another subject, The pictures of your dining room in this project show an upholstered chair with a mahogany table. I would love to know where these chairs came from as my dining room chairs have gotten very dated (47 years) but the table is still great. Until tomorrow with coffee in hand–thanks Yvonne. Good tips and so wise – we all have way too many “bargains” that never really fit. When we moved from a three story home to a garden home we had an entire floor that looked as though we still lived there. After our employees went shopping for what they wanted, the Salvation Army rolled up with a truck and two men to fill it up. The lesson was learned – now every summer I pretend we are moving and have a big throwaway/giveaway party. It’s very liberating. I just discovered your blog and love it. One of the things when shopping I learned is if you love it, buy it now or it will be gone tomorrow. Which is true for the most part. But as you say can I use that piece, do I have a place for it and do I have something at home I can repurpose first? Now we are renting and have moved several times since our house was foreclosed on. 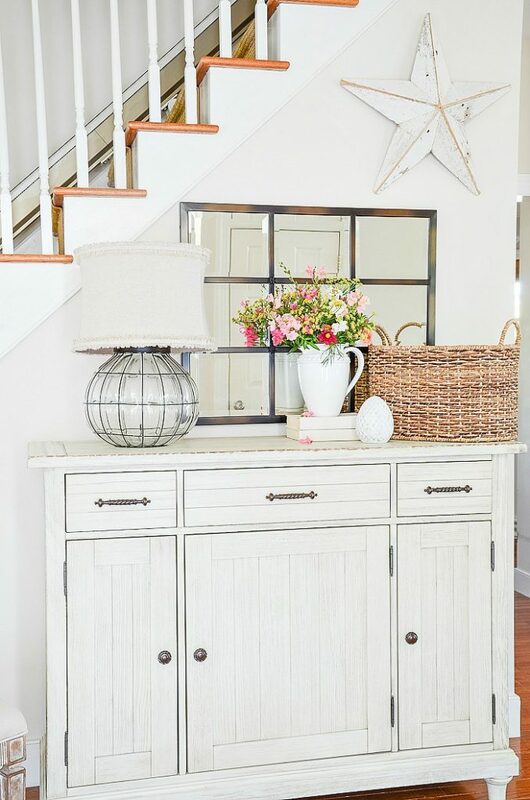 However, I love to decorate and once I have been on someone’s amazing blog, I’m running out to the store hunting for that piece and usually if I can afford it buy it. So does that really work in decorating my home? Well (said in a high pitched squeak) LOL! Not always. I think all your ideas are spot on, I would add to find your style first then maybe work on one room at a time or 2 that join each other. I love your style but adding it to my mismatched furniture and pink n beige walls so far hasn’t worked. It is very hard being a renter, but my landlord is wonderful we are allowed to paint and in the Spring and Summer we are going to do just that. Then I would love to add some of your wonderful touches to my home and paint my old tired furniture pieces (we are saving for a house now) and cover my UGLY leather sofa….ick! Once we purchase a new home, I’m getting rid of most if not all of my furniture, it was tired 5 years ago but I’m not investing in furniture until we move and own again. That is my goal and can’t wait, but until then, work mostly with what I have. But will continue to add some inexpensive items to freshen things up a bit! Thanks so much. God bless. This is honestly one of my favorite posts you’ve done! I loved every point you made. I’m not really a hoarder or a collector by nature and always find myself thinking very carefully before making a purchase. I always like to think about where I’m going to use item “x”, how it’s going to look with the rest of my decor, and most importantly to me, will I kick myself later for buying item “x”. Because for me there’s nothing that irks me more than wishing I hadn’t paid hard earned money for something that I wish I hadn’t purchased in the first place. I absolutely hate wasting money, so I guess that helps me be more thoughtful with home decor purchases. I have noticed quite a few people (bloggers, friends, and my favorite HGTV host Joanna Gaines) talking about clearing the clutter, allowing a room to breath and really just simplifying our homes this year. I’m all for being very mindful about every purchase, whether it’s a large piece or a small item. I also really loved the point about saving your pennies and then buying a one piece that you might love much more than buying lots of little items that just add to the clutter over time. Overall a great article! Thanks so much! All great tips. My mother told me once if uncertain, wait a week. If that thing is still on your mind go back and get it. So many times that waiting period allows me to really decide. On the other hand I have some regrets on missed treasures, I can’t remember now what they were which certainly means I didn’t need them, but I do recall the feeling og going back to get something that was gone. Your ‘ 10 pointers was great advice for the young or those like me “I was young once upon a time…I think”. Excellent list! One of the things I do is put something that catches my eye in my HomeGoods shopping cart and drive it around the store for a little while. I get to enjoy the item up close and to think about many of the questions on your list. Most of the time I wheel it back to the shelf where I found it. My sister and I refer to this as something visiting with us. Like so many others who commented, I have been sorting and finding new homes for a lot of things. I’ve noticed this trend toward downsizing for a while now. Could it be we are all at the same stage in life? Or is it I’m just noticing others downsizing because I am? I agree with the person who requested a return to darker ink. Old eyes have a hard time reading grey, especially late into the night. You are so wise for your years! You must have had wonderful Godly Parents to give you firm and biblical guidance in life. I love your Blog. Thank you in big gigantic bunches! Since I started blogging I have bought so much stuff. Most of it has been relatively inexpensive but half of it I don’t really need. Honestly there isn’t anymore room for another dish, glass or charger. I’m going to be as creative as I can with what I have. Right now saving for a bet camera is more important than new tableware. This is so timely. I am in a major PURGE mode and it’s been fairly easy to see how much waste has gone on through the years. I’m making progress and your post has reinforced what I’m working on, with some extra great tips. Thanks. I love your new styling but CANNOT read the light grey text you’re now using. I have tried multiple times. I know grey is stylish but please, not for reading text. Can you change back to black text? Please??????? Others may have commented on this but I can’t ready their comments either. Really fabulous advice, Yvonne!. I wish I’d known about number 8 when I bought my first expensive sofa. It lasted way longer than I wanted it to! Love your post, but I really like the print of buildings above the chest! Can you tell me about it? Name, where purchased… After I hear the details, I’ll reread your list! Great post! Now if only I had your talent to pull it all together or get the vision or better yet just had you to come decorate! My situation is a lot like Maria Franca in that we are trying to shoe horn our belongings into the family farm where my mother-in-love lived for 80 years. Deciding what has to go and what stays can sometimes be overwhelming. Changes to a style we are comfortable in can be difficult for everyone else. What a lovely expression! … mother-in-love””!!! Thanks for the great list! Very thought-provoking. I agree that we tend to want a lot, and need very little. I remember my parents saving to buy something they loved, and they made certain they loved it because it would have to last quite a while. I believe it is better to surround yourself with a fewer number of cherished pieces than lots of impulsive “I will use that someday it is such a good price!” pieces. And yes, I am guilty of not following most of your ten reminders! Hi Gwen, thanks for the nice compliment! I am not a trained professional. I just love all thing home and have been making mistakes and learning for decades! All great hints. Also what helps me is when I lose the “keeping up with the Jonses” mentality. I found in my first couple of years blogging, I was spending and shopping for things to post about! Ridiculous! Less is more. Wise advice! As I was reading, I was thinking about the want vs. need question – so glad you mentioned that at the end. It’s the toughest one to conquer imo since it requires logic to rule over emotion 😉 What I accidentally learned over time was whether certain items worked in multiple rooms. This kind of goes hand in hand with the “do I love it” question because usually something you love, you love it in many rooms! When I feel a need for change, moving things around works the majority of time for me now. And don’t forget about the best changes of all, and it’s free, and happens all by itself outside our windows of every season! When I started purging and repurging a few years ago, I slowly discovered how liberating minimalist decorating was. I was amazed how quickly I fell in love with the look “not too little, not too much”. It happened accidentally as I was tired of seeing *stuff* and being a slave to maintaining it, shopping for it, paying for it, etc. Time is precious and you can’t take it with you as they say 🙂 I am finally liberated from the need for more and new stuff and lovin it! What a timely post. I have been stalking (for MONTHS!) a bamboo serving cart at the local consignment store. Tomorrow it goes on sale for 15% off. I dearly love it. I can afford it. I am not exactly sure that I have a place for it. Sigh. all of these are great questions to ask yvonne…and i couldn’t agree with you more! i’ve made quite a few decorating “mistake” over the years but now that i’m a bit older and hopefully wiser i make better choices when buying something….not always but most of the time! 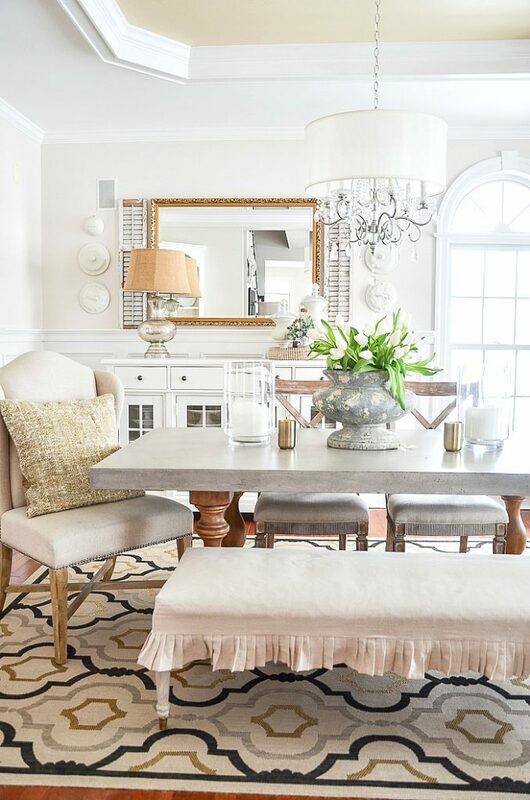 i once read that decorating trends last about 10 years and i find that to be mostly true….of course there are exceptions but when i see some homes full of all white furniture/accessories or painted one single color, i wonder what’s going to happen to them when that goes out of style? i wouldn’t want to be in the position of having to replace all of that stuff and no one wanting to buy it since it’s “out of style”! 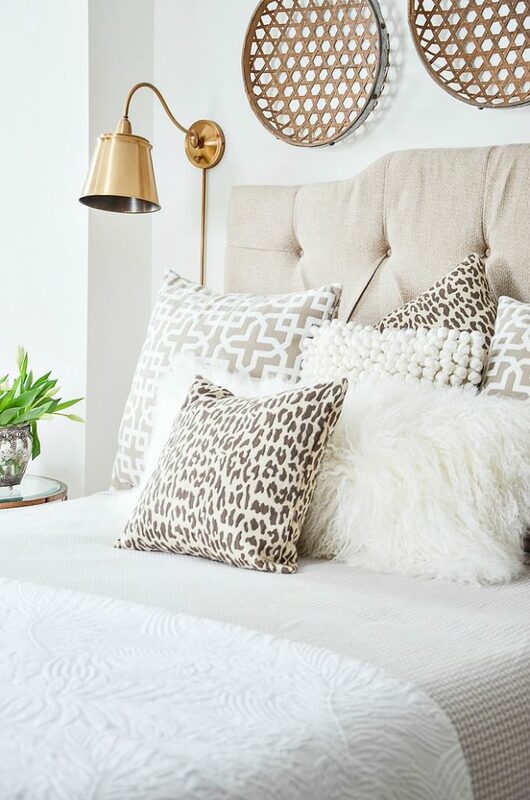 that’s why i stick to buying neutrals in my “big” items and add color thru accessories such as pillows, etc. Another Great Post, Yvonne! Love your tips! I moved across the country 8 months ago, and AM STILL “purging & tossing!” What worked so well in my last home doesn’t always work here, even if I love it. And, sometimes I get tired of the “same old accessories” again, even if I love them. I love your home, too, it has become an inspiration for me! I had to laugh! There are so many wonderful things on my friend’s blogs that just would not work in my house. SIGH! Great lesson to learn! Excellent!!!! Thank you for putting into words what I’ve been thinking and need to do. As I trip over the most handsome, expensive, dark green leather (dyed through so no scratches show), studded, made to last FOREVER, couch in our basement storage area – I can totally agree with No. 8 – WILL YOU LOVE IT IN 5 YEARS. When we bought it we were of the mind set that you should save for and buy this one great piece of furniture that will be the centerpiece for other such pieces over the years. And it was! For about 5 – 8 years and then styles went from Hunter Green and Burgandy colors (all very rich and warm), to a paler color palette. We stuck with the rustic look as long as we could and then finally moved on. But we just can’t seem to part with sofa. We have even had a 2nd Hand store owner come out and look at it and he would love to take it – still can’t part with it. So it sits, all covered and lonely, it’s handsomeness covered with old sheets ( a few rustic studs peeking out). Have you investigated having the couch redyed? Fantastic tips! After helping a friend move from a 3 story Victorian to a ranch house and moving all of her possessions, plus my FIL is down sizing and can’t seem to throw out anything either, I do not want to have a house full of stuff! Will be having a major purge very soon. And with your tips I hope to keep it that way! Thank you! Good questions Yvonne!…I am fortunate to have an antique/vintage/gently used items booth……so when I buy something new to replace an item in the house . . . it goes to the booth!…a win, win. You are a very wise woman . . . would take your advice any day!!! I just posted on another blog about my recent experience. My husband of 42 years passed awY recently & I decided to downsize closer to family. I had a 1700 sq ft attic FULL of ‘I will save this may use it later”! Being alone I had a very hard time clearing out that space. House sold in 3 weeks & I had years worth of THINGS. This is another item you could add to your list. Luckily I had several charity organizations I could donate to. Thanks for the great pointers! Theresa, so sorry for you precious loss! Thanks for sharing your valuable advice! 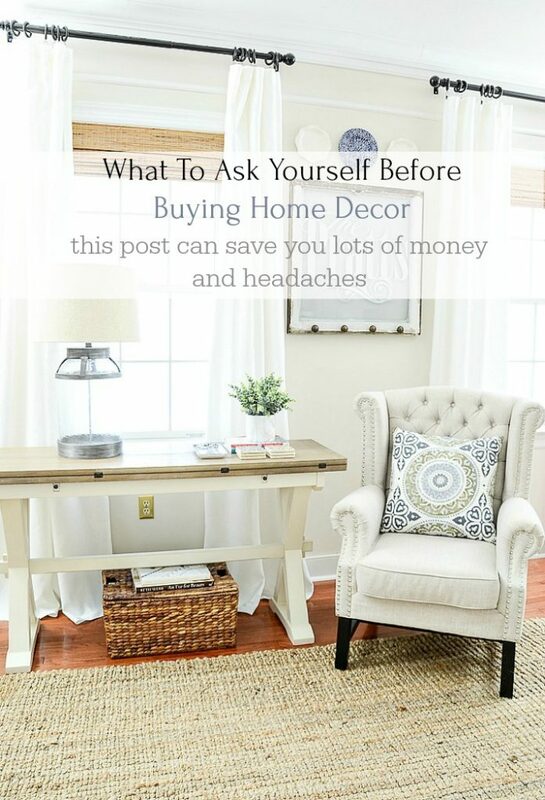 What a wonderful post with a lot of great questions to ask yourself before making that purchase. I am pretty good at paring down and keeping things clean and organized, but it is always good to be reminded of good ideas to not add excess “stuff”. By the way, I LOVE the white astilbe! I have no garden any longer, having moved to a high rise condominium, but I am considering sneaking out to our “backyard” cliff along the lake and planting some astilbe! Happy and thoughtful shopping to you! This should be in everyone’s wallet! The bible of shopping!!! i ask if i would be sad if it is gone or regret not getting it. i shop at a lot of antiques malls and i buy vintage kitchen stuff. Great tips, Yvonne! Sadly, my robotic self tends to put things in my cart before I can even process if I can live without it or not! LOL Your home looks gorgeous, as always! I’d still love to know where you purchased your zebra print cowhide. (My new email address is: jbertotti@verizon.net. We downsized from a 5,000 square foot traditional home in the mid-west, to a 2,700 square foot home on the gulf coast. We spent almost 9 months selling and giving away our old furniture and decor before moving so that we could change our style. It felt so good to purge, and at the same time seeing others that enjoyed our well cared for items (my daughter and son-in-law just bought a new, empty home!) Another benefit of getting rid of it was the lower cost of moving! So many people don’t realize that the cost to move (or store) stuff often exceeds it’s value! I’ve enjoyed a slower, more thoughtful approach to decorating the new home. Thanks for the timely article and advice! Good post, Yvonne. I am not one to judge, but when I started blogging almost two years ago, one of the first things I noticed was all the “stuff” bloggers seemed to create and own, and put around their homes. I kept thinking, “where do they PUT all this stuff? ?” Using the garage for anything other than the cars was out of the question for us. I am an antiques dealer, and my ‘stuff’ fills the basement – walls of labeled tubs and boxes. I had (and still have) my own collections – dishes being one of those guilty pleasures – but all the accessories just blew my mind when viewing blogs. I am in the midst of purging my basement and reorganizing (over 40 hours already clocked, with loads of trash and donations already). I will say, though, being a dealer allows me the flexibility to rotate collections and sell when the guilt overwhelms, lol. Textiles are another guilty pleasure of mine, so I suppose my linen closets and drawers will be the next big project I dive into. It looks like that may be 2015! Great tips! I do the same thing…it helps take some of the “on the hint factor” out of it…lol and it keeps me from buying something just to buy! Great timing!!! I’m heading to HomeSense this morning to buy new towels. But I know that not all I’d buy. Now I’ll shop more carefully. Great tips, Yvonne! Very good tips — We’ve downsized and now have room for zilch. Our house is still a work in progress and frankly I’d love to get rid of everything except a few key pieces. Parents passed away and we were given things I don’t want, doesn’t go with the decor, and I really don’t have room for it 🙁 So a major purge should be in the works. And holiday decorations? That’s a think of the past – no room for storage. BUT! I love your house and I like the light over your kitchen table. I keep looking at it and thinking that the brass light over our table would look good spray painted black!! All of us need to do this! Great questions to ask yourself!! !